This is my first CBD product I ever took (still taking) and knew nothing about it until I’ve met the owner of this awesome family run company who introduced me to the wonderful world of cannabinoids. I’m dealing with severe panic attacks for many years, conventional medicine and conventional herbal remedies didn’t really work. I got nothing to loose so decided to give it a try and purchased Farmacy Bliss CBD softgels. Best investment in my health ever! I have been taking it everyday since July 2018. It took couple of weeks to feel the effects. It was subtle at first but now I can definitely feel the difference of how I felt just couple of months ago and how I’m feeling now. Better control of my thoughts, the “about to panic” state is much easier to eliminate before it even goes into full blown attack. I know that everyone reacts differently and the dosage can also vary. For people like me one capsule could be too relaxing so I’m taking half the softgel everyday and it works wonderfully. Excellent quality! No withdrawals even if I miss the dose, no side effects. Try it out and see for yourself. I’ve been buying CBD softgels from Farmacy Bliss for several months. I have Crohn’s disease and I found that CBD helps keep the inflammation down. I’ve been feeling calmer overall and don’t have as many flare ups as I used to. Their customer service is great and shipping is fast and free! Highly recommend it! Highly potent and effective. My daily driver for anxieties and inflammations. Took these when I had a bad case of sciatica and they were the ONLY thing that helped. They reduced the pain substantially as well as the inflammation so I could finally start to heal . They also significantly reduced the stress I was experiencing without making me feel sleepy or slower. Thanks! I have just about finished my soft gel capsules and I have had fantastic results. My back pain has reduced significantly and my stress levels have come down and are manageable. It is amazing. Thank you so much. Hands down one of the best brands out there. Their hemp CBD is somehow more potent than others, and it really makes a difference. I’ve trouble falling asleep and over the counter stuff made me feel worse. A friend recommended for me try FB products and so far so good. Taking a capsule before bedtime helps calm my mind and energy, and eventually I dose off. No grogginess upon waking up. Love this brand. I use all of their products daily to maintain good health, as well to diffuse any neck pain or headaches that arise. Their products are incredibly convenient to use and very effective. I carry their vape pens in my pocket when I go out and simply take as needed throughout the day. I use their products morning to night. Love the soft gels from Farmacy Bliss. Helps with my Essential Tremors, stress and anxiety. One or two capsules gets me through the day. I feel better and not tired when using the gels over the medication for the tremors. Thank you for a great product! 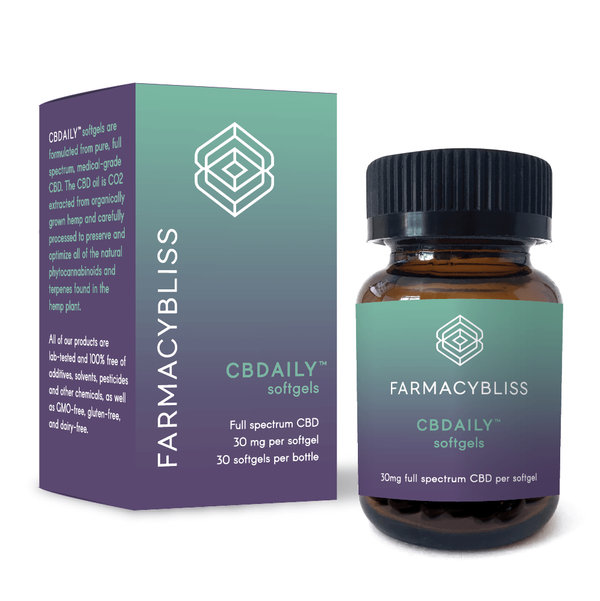 Farmacy Bliss CBD Capsules Are Both Effective and Economical! First, I did research online. Then I ordered one bottle of Farmacy Bliss 30 mg CBD Capsules. I used the capsules. I felt and slept much better. Then, I ordered 3 more bottles and today I just received 3 more bottles in the mail. You can say I’m sold on their product. Simply because their CBD Capsules WORK. I’m a Medical Marijuana recipient who is retired. I use THC oil and vapes during the day and evening to ease the chronic pain of a curved spine due to scoliosis and arthritis. 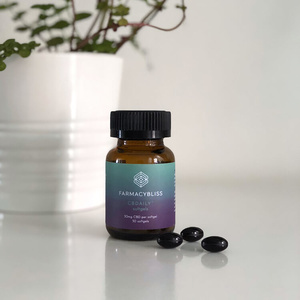 I was feeling anxious at night until I found Farmacy Bliss 30 mg CBD Capsules. I take one or two before bed and it really takes the edge off and makes everything mellow. I’ve been getting 7 hours of restful sleep every night according to my Sleep Number bed. 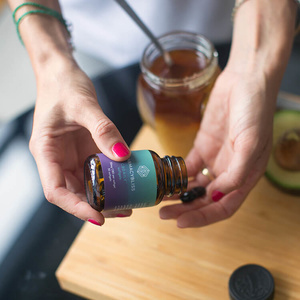 Their CBD Capsules, also, helps alleviate inflammation, slows intestinal motility, produces an overall calmness during the morning & day, cures any headaches and reduces arthritic pain and nausea. I, also, take it during the day as needed. If you read over the Certificate of Analysis for Farmacy Bliss CBD Capsules you will see that their CBD is full spectrum and very pure. The reason behind their capsules’ effectiveness. If you research CBD Capsules and compare their COAs and their cost, you will find that Farmacy Bliss CBD Capsules give you more effectiveness for less money. Try it. You’ll feel better! You won’t be disappointed! I really can’t imagine living without CBDaily capsules. I have severe arthritis in both knees and hands. Since starting to take them six months ago, I can honestly say, I feel like I no longer have arthritis. I walk about 4-5 miles a day and they make a huge difference. If I forget to take them one morning, I absolutely notice! These are great. Helps take the edge off my anxiety and helps with period pains. I’m on my fourth bottle! First off, customer service is excellent. I was trying to get some to try before a trip and holiday shipping was troublesome but they got them to me in time! I took them for some nausea and fatigue connected with some meds and they are helping. Will get some more.